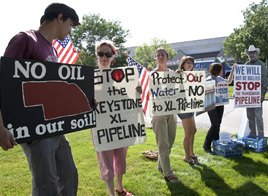 The battle over the Keystone XL Pipeline, instead of being deferred as President Obama wanted, has become a pressing political issue. Apparently the Republicans want to make something out of the Administration’s postponement of any decision until after the election. What’s that about – why the sudden importance for the GOP? – is only one of many questions the press should be asking. The proposal of TransCanada to build a pipeline from the Alberta oil sands to the Gulf Coast has been reported weakly by the media overall but one aspect of the environmental issue has gotten some coverage. Even those paying little attention understand that there is major risk involved in letting a company with a poor safety record build a pipeline carrying low quality crude oil over the Ogallala Aquifer. We need not spend a lot of time speculating on the damage even a minor spill could mean for the millions of people dependent on that immense resource for their water. This obvious and potentially fatal aspect has eclipsed any serious discussion of the economic issues involved. In the absence of reporting, there has been unrelenting, endless TV and print advertising promoting the idea that building the pipeline would, in itself, solve America’s jobs problem. Hardly mentioned at all is that the pipeline could have the effect of reducing employment in the U.S. oil and gas industry. So jobs, obviously, are one economic consideration. There are many others. Proponents of the pipeline argue that there is an immense amount of oil in Canada, and that Canada is our largest, most reliable source of foreign oil, much of which comes from oil sands. The Canadians intend to increase oil sands production regardless of what American environmentalists think. Further, given our insatiable appetite for petroleum, pipeline supporters say it is inevitable that it come here. This is of benefit to the U.S., it is argued, since Canada is a more “secure” source of supply than other foreign sources. But the notion of Canada as a more secure source must be viewed with considerable skepticism by anyone who is old enough to remember the energy crises of 1973 and ‘79. Experience suggests that the Canadians are no more likely to give up a serious economic advantage for our benefit than we are likely to do the same for them. There is also the question – virtually unmentioned as far as I can see – of what refineries are the most logical destinations for Canadian crude oil. The proposed line is 1,700 miles long, from Alberta to the U.S. Gulf Coast. (See map.) Assuming the intended market is the U.S., there are much closer, more economic end points. For example, why plan such a pipeline to bypass existing U.S. Midwestern refineries and markets? What kind of economics is at work here? A pipeline half the proposed length could get the crude within tanker range of the U.S. West Coast where there is more than adequate refining capacity for such heavy and sour crude. And why the end run past the refineries of the Upper Midwest? TransCanada told the Canadian Government that these U.S. refineries and their customers have been enjoying low crude oil and product prices because of Canadian crude oil. The Keystone XL line would end this “discount” and raise fuel costs in the region about $4 billion. In whose interest is that? And shouldn’t it be part of the discussion? Why pick the Gulf Coast when these other, closer sites are at hand? What advantages does the Gulf offer? Isn’t it just possible that one reason might be the fact that the destination of the proposed line gives Canadian crude access to a “free trade zone?” This means it can be brought into the U.S., refined and exported free of any trade restrictions and some taxes. Indeed there is considerable evidence that the owners of the line intend to export either crude oil or the refined product. If that is what they have in mind, what’s in it for us? On the other hand, if export is a main goal, why ship the oil 1,700 miles to the Gulf Coast when it would be shorter by half to ship it to the Canadian West Coast? In fact, there is a proposal pending before the Canadian Government for the construction of pipeline capacity that would do just that. Such a line would not only give Canadian oil access to the existing heavy crude refining capacity on the U.S. West Coast but access to China, reducing Canada’s almost total dependence on the U.S. as an oil market. Here the problem seems to be that the enthusiasm of the citizens of Alberta for an oil sands pipeline is not shared by the people of British Columbia who may have environmental objections of their own. So an important question – one I haven’t seen addressed in news media accounts – is: Are the citizens of the U.S. being asked to take a significant environmental risk in order that the oil companies can get past an environmental obstacle in Canada? And suppose the Canadian government does permit a pipeline to Vancouver or other British Columbia ports: What happens to the economics of the Keystone XL then? The press needs to address questions like these, and there are plenty more of them. For example, what is the present relationship of the proposed line with the potential shippers? The Globe and Mail reported a year ago April that the refiners buying oil sands crude “have joined the revolt against pipeline makers for building too much capacity too fast.” The paper also reported that several smaller U.S. refineries were suing TransCanada in an attempt to break their contracts to ship on the Keystone line. To the extent that there has been discussion of the economic issues, it has been limited to a debate over how many jobs would be created by the construction of the pipeline. On this issue the proponents of the pipeline got off to a bad start. They made such exaggerated claims about the project’s ability to create jobs that their projections virtually fell of their own weight. But there is a jobs issue that has not even been mentioned: What happens to our newly resurgent domestic oil and gas industry if the Keystone XL line gets built? One distinguished economist has argued that the proposed line will result in Canadian oil sands crude being “dumped” into the U.S. market – using dumped in the legal sense of a product being sold in a foreign market at a price or volume below what the economics of its domestic market would explain. In effect it would badly damage our domestic petroleum industry. The same economist has argued that the Keystone pipeline is “OPEC’s Trojan horse.” He claims that the new pipeline will “allow refiners and foreign suppliers to drive a wedge between the prices of oil produced in the United States and oil produced in areas such as Africa or the Middle East. This wedge could exceed $20 per barrel.” This could reduce oil and gas activity in the United States, making us less secure. None of these economic considerations should make us forget that the oil from the Alberta oil sands is truly awful stuff, with major environmental risks in its production, transportation and refining – not to mention its consumption. Its potential contribution to making the planet much filthier is very serious. The people who are proposing that we facilitate this venture need to be far more explicit about the economic benefits that purport to make it acceptable. Not quite sure I know what the point of your column is. Is this one of the typical left-wing reflexive “if its green, its good” or are “just asking question” in the Glenn Beck stlye, questions designed to lead the reader to a predrawn conclusion. The Ogallala aquifer point is really a non starter. Over% of the Aquifer’s water table is west of the planned route and this portion is uphill of the pipeline. Any oil spill would be confined to the 20% of the water table east of the pipeline as gravity would keep it from flowing uphill. In this 20% region, the water table is over 50’ deep and covered with a layers of gravel and clay, meaning a spill would easily be contained and localized. Where the pipeline does come close to surface water, it will be sealed in a waterproof membrane and encased in concrete making a leak from this portion highly improbable. You then go onto question why the pipeline isn’t delivering to Midwest refineries. Had you relied on fewer partisan and ideological sources you would have realized that the pipeline is directly servicing one large refinery in Wood River Illinois and a distribution tank farm in Patoka Illinois. Last I checked, both of these locations are in the “midwest”. The Patoka terminal supplies refineries in several states including the Chicagoland and St Louis region. The pipeline will also service a large oil storage and distribution facility in Cushing Oklahoma which supplies crude to several surrounding states. The “export” argument has been twisted out of the bounds of reality. For quite some time the United States has consumed far less heavy fractal distillates than it consumed and a more recent trend has been declining demand for gasoline. We have always exported the heavier distillates (diesel, kerosene, fuel oil, etcetera) but one of the results of the recession is that we consume much less gasoline than we used to, but we still have the same (if not even more) refining capacity. Petrochemicals are fungible products and if we are not consuming them, there is still a market for them. I am not quite sure why any rational educated person would see this as an issue. We have the capacity to refine these products, we don’t have the demand, why not refine it here make some money and export what we aren’t using? You glossed over any information that would have challenged your point. So, what was the point of the article? Was it just an exercise in motivated reasoning? All those questions are valid but moot. It's Way too late to start asking any of those questions, the deal is done. Gulf Coast oil companies have invested $10 billion in there refineries getting ready for the extra influx of oil. A company called Valero already has a contract to buy 20% of the flow for export. And here I thought we were working toward energy independence. The question to ask is how anyone expects economies to grow with high energy costs. Gas prices were the final straw that broke the economies back in 2008 which forced the exposure of the Wall Street scams. People could not pay the mortgage plus high energy and food prices. Commodities are high even now in this depression and race upward at any sign the economies might be recovering. All I ever hear for an answer are crickets chirping. Since the Keystone pipeline is already finished and on line as far as Oklahoma, see (below inserts Phase I and II, could it be that the Oil Cartel is trying to get the Federal Gov to finish it into Houston so they can take this oil refine it in Houston and ship the gasoline at higher prices than they can get in the US. And since Texas is so big and doing so well according to Perry shouldn't the state of Texas pay for their own pipeline, after all if it was just a case of oil for Texas they could easily ship it from Oklahoma by truck. The 3,456 kilometres (2,147 mi) long pipeline runs from Hardisty, Alberta to the United States refineries in Wood River, Illinois and Patoka, Illinois. The Canadian section involves approximately 864 kilometres (537 mi) of pipeline converted from the Canadian Mainline natural gas pipeline and 373 kilometres (232 mi) of new pipeline, pump stations and terminal facilities at Hardisty, Alberta. The United States section is 2,219 kilometres (1,379 mi) long. It runs through Buchanan, Clinton and Caldwell counties in Missouri, and Nemaha, Brown and Doniphan counties in Kansas. Phase 1 went online in June 2010. From Steele City, Nebraska, the 291 miles (468 km) Keystone-Cushing pipeline was routed through Kansas to the oil hub and tank farm in Cushing, Oklahoma in 2010 and went online in February 2011. The questions that author has posed are all excellent for regarding the proposed pipeline. The really momentous nature of the Keystone pipeline without any real scrutiny by our mainstream press-especially television news is another classic example out of so many that our democracy is indeed flimsy. There were very few questions posed by the media in the run up to the fiasco of the Iraq war and now this pipeline is probably another fiasco because there is so little public scrutiny to speak of. Here is information you can't find in any US media. Like I said above, how are economies ever going to recover with manipulated high prices. How about asking why this is allowed to go on. The pipeline is a smoke screen compared to ripping off the world. "TransCanada told the Canadian Government that these U.S. refineries and their customers have been enjoying low crude oil and product prices because of Canadian crude oil." You don't list sources for much of what you are saying. This statement (above) sounds like heresay.